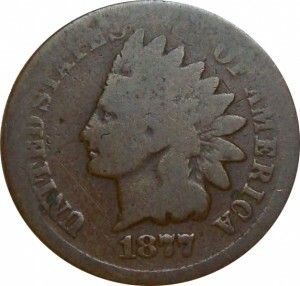 An Indian Head Cent value is determined mostly by the mintage of the date, the lower the mintage the higher the value. It doesn’t matter how old they are since many older dates are common. However, the values start to improve from 1886 and earlier and are just about double in value compared to dates after 1886. All common date Indian Head value in AG3 to G4 grades will begin at .25 cents “raw’, and will rise in value as the grade and condition increases. You can sometimes get a few dollars out of choice, low grade, Indian Cents but the common dates are numerous and easy to find. The key dates are 1877 and 1909-S and their value in G3 starts at $500, the semi-key dates are 1908-S, 1872, 1871 and they have a starting average of $50, then any date from 1878 and earlier will be worth $10-$30 in G4. 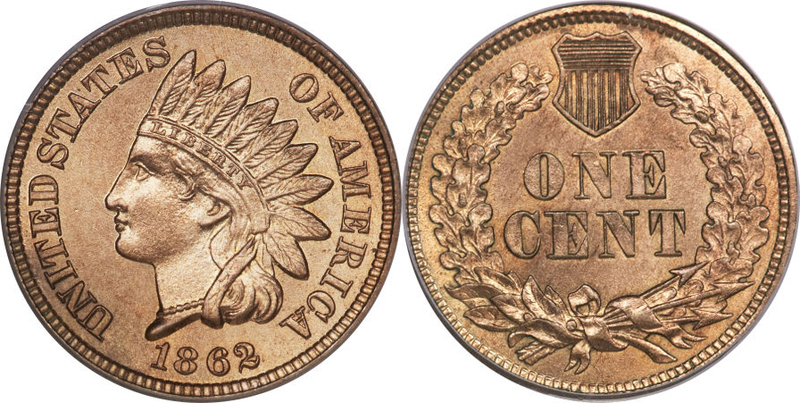 Indian Head Cent value for dates 1859 through 1878 show a substantial premium in the grade EF (Extremely Fine) and up, some can be worth a couple hundred dollars and the 1877 is worth over $2,400 in this grade. The values for the above date range increases with each grade with AU (about uncirculated) being worth more and some MS (Mint State) grades can top the $1,000 mark. As with any coin copper coin series values of each grade is also determined by three toning factors and these are: RD (Red), RB (Red/Brown) and BN (Brown). RD brings the most premium followed by the RB and then BN, with BN being the most common toning for copper cents. Gem quality, MS65-MS69, examples are the most sought after and most valuable grades. Finding varieties is a hobby in itself and increases the value of certain dates because collectors tend to buy, online, numerous examples of a particular date in hope it’s the valuable variety. So Indian Cent Value for the variety is something worth noting since some of these varieties are considered dates that are part of the series and must be added to a collection to make it complete. 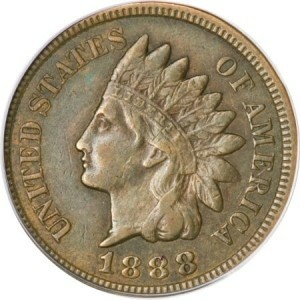 Here’s the most known Indian Head Cent varieties to look for: 1860 Narrow Bust, 1864 L (Narrow Bust), 1865 Plain 5, 1873 Closed 3, 1873 Doubled Die, 1888/7, 1886 Type 2, 1894/94. You should always be looking for repunched dates (RPDs) and misplaced dates (MPDs) in this series. You can sometimes find date digits that are not where they’re supposed to be or date digits punched on top of another. Currently the 90% copper cent is worth at least melt value but numismatic Indian Head Cent value far out-strip the precious metal value. Plain edge, no mint mark and struck at the Philadelphia Mint. Indian Head Cent value, by date, mintage, condition and varieties.